Hoogeveen Chiropractic Wellness Center is the premier chiropractic and wellness center in Bellevue and the surrounding community. Our chiropractors are Palmer College graduates equipped with a variety of techniques that can be tailored to fit the needs of each individual patient. We encourage you to read more about each of our doctors; Dr. Gregg Hoogeveen, Dr. Adam Hoogeveen, Dr. Brooke Harre, and Dr. Logan Harre. What truly sets our center apart, however; is the tremendous staff team ready to serve you at HCWC. We desire for each visit to our center to be the highlight of your day, and we work hard to be a place that you can’t wait to tell your friends about. HCWC was founded in the summer of 1999 by Dr. Gregg in the Bellevue Health Center. He has been practicing chiropractic for over 30 years now, and was a clinic director for a large 8 doctor corporation in Oshkosh, WI when he decided to start his own practice in Bellevue. 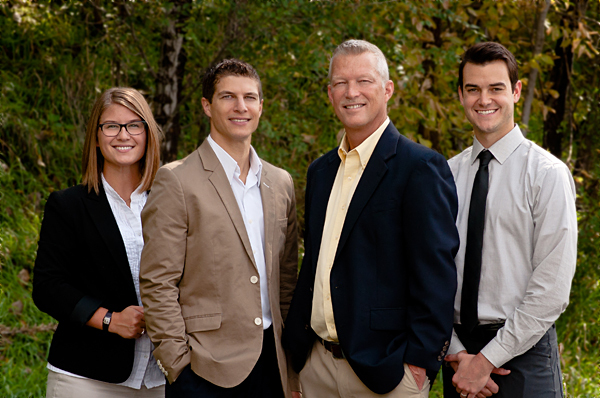 His son, Dr. Adam, graduated from Palmer College of Chiropractic and joined the practice in early 2010, and they built and moved into our current building in May 2012. Dr. Gregg’s daughter and son-in-law, Dr. Brooke and Dr. Logan, graduated from Palmer College in the fall of 2015 and joined the practice shortly thereafter. HCWC has always and will always have its foundation in delivering amazing chiropractic care to the community. However, after adding three more doctors and moving into our new building, we are quickly becoming a more comprehensive wellness center offering massage therapy, fitness classes, nutritional supplements, and so much more. We can’t wait to serve you no matter what your health care needs are!